The 3-D Glasses (セガ3-Dグラス), also known as SegaScope 3-D Glasses, Óculos 3D in Brazil and Anteojos 3D in Argentina is a Sega Master System peripheral which creates the illusion of three-dimensional graphics in certain video games. They were invented by Mark Cerny of Marble Madness fame. The 3-D Glasses use a shutter system to close the left and right lens rapidly to create a 3D effect. 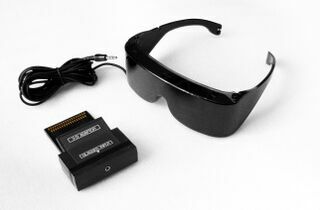 The Master System glasses can only be used in the original Master System, since it hooks up directly to the card port not found in the Master System II (US/EU model). Such a system allows 3-D graphics in full color. A disadvantage is that it halves the effective frame-rate, which some users can perceive as flicker. It also tends not to work with non-CRT-based televisions. The Glasses were released in the UK in October 1987 at a price of £39.95, with the North American release in the same year. The 3-D Glasses were also released in Japan in November 1987 (initially bundled with Zaxxon 3D) and both Brazil and South Korea in 1989. Main article: 3-D Glasses/Magazine articles.